Gold has continued its drop, falling to its lowest level in almost three years, after the US Federal Reserve said it could wind down its stimulus programme. The US Fed said last week that its bond purchases would start to "taper off" in coming months if the economy recovers. "You don't want to catch a falling knife, so people who might be buyers are stepping aside and don't want to show gold at their quarter-end statement," said Axel Merk, chief investment officer at Merk Funds. Gold mining's industry body, the World Gold Council, has released new guidelines for calculating the true cost of producing the metal. At the moment, the "cash cost" of gold only accounts for a portion of what it takes to produce an ounce of gold. Under the new "all-in" measure, not only would the day-to-day cost be included, but also capital expenditure and licensing costs. The new method means an ounce of gold would cost almost $1,400 an ounce to produce, according to the chief executive of Gold Fields, Nick Holland. With the price of gold now below $1,200, this would make many operations unprofitable. The move comes as South Africa's gold mining companies go into wage negotiations with their workers, who are demanding rises of between 60% and 100%. That saw many investors turn to gold - seen as a traditional safe haven asset in times of uncertainty. At the same time, the slowdown in the global economy, prompted central banks across the world to lower interest rates - to historic lows in many cases - in an attempt to try to boost growth. 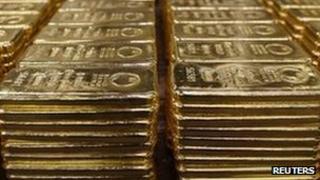 Analysts said that with interest rates so low, investors have been favouring gold. Analysts said that such a move may see interest rates rise again - making gold a less attractive option. "Gold's major attribute as a potential hedge against a major global crisis has been diluted," Mark Matthews of Julius Baer told the BBC. Mr Matthews said that given these factors the gold price may fall further.